Meh. That’s how you’ll feel upon completing the downloadable content for Mass Effect 2, called Arrival. If you’re a Mass Effect junky like me, than you’ve already bought the DLC. For those on the fence, you’ll be served just reading a summary online. Arrival sets the events for Mass Effect 3 in motion. A scientist named Amanda Kenson has discovered a Reaper artifact—it’s never explained how she found it—she’s then captured for suspected terrorist acts against Batarians. Obviously this is a job for Commander Shepard and crew…or not! One of the biggest problems with Arrival is you’re solo throughout most of it. Sure it’s not necessary to have a full team, but squad tactics and uniting your teams’ powers together is one of the best parts of Mass Effect 2’s combat. Arrival feels like a run-of-the-mill corridor shooter. Arrival breakdown: Mediocre stealth section to start things off; then for the next 45 minutes open doors and shoot the waves of enemies the pour out. Simple. Arrival is just plain boring. Everything depicted in Arrival could have been summarized in some form of short story. Yes, Arrival does explain how Mass Effect 3 may be structured (which has been a matter of debate), but there could’ve been a more elegant implantation of this info. Like saving it for Mass Effect 3. 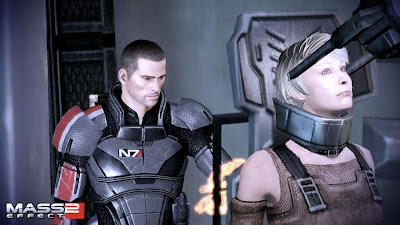 Why couldn’t this have been the first mission in Mass Effect 3? Not the gameplay, but the explanation for how Shepard staves off the Reapers’ immanent attack. It just feels like the Mass Effect “B Team” designed Arrival. It reminds me of the lame Pinnacle Station DLC that was released for the original Mass Effect. Both are poor representations of Mass Effect’s appeal and…ah, I’m done! The Reapers were coming in 2 days; Shepard changed that to years. You just saved $7. Mass Effect 3—December 2011.
damn... I am disappointed in hearing this. It's not like them to do this. I might still get it but I highly dough it seeing that I didn't buy the ME1 DLCs.